Romex provides multiple solutions for creating resilient, permeable hardscapes. Primarily, Romex resin-based jointing mortars provide a water-permeable grout for jointing unit pavers of almost any kind, for both unbound ('sand-set') and bound ('mortar-set') paving assemblies. 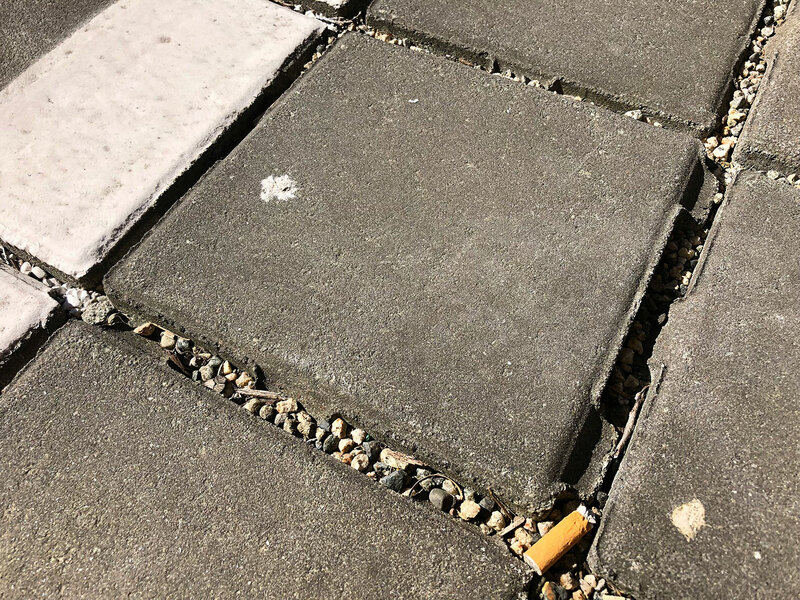 Unit pavers that are specifically designated as “permeable pavers” - with larger joint spaces in between - can benefit in particular from Romex jointing solutions (see section below). HOW DOES ROMEX JOINTING MORTAR ENABLE PERMEABLE PAVING? ROMEX permeable paver jointing mortar is a matrix made of two key components. The first is the proprietary ROMEX resin technology which serves as a binding agent and is responsible for hardening and stability. The second component is the filler material, which is responsible for water permeability and structure. The filler material is a washed, angular, fire-dried quartz sand with no zero components (i.e. no dust) with a mesh size / grit size that is controlled within specific ranges to provide a particular grain size. When the filler component is mixed with the resin binder, a unique ‘resin-bound sand’ is formed. It is the incredible strength and performance of the Romex resin which enables a coating around each grain of sand so thin, that hollow areas between the angular grains can still form – through which water can seep. The size of the hollow areas is dependent on the size of the sand grains, which determines the degree of water permeability. In conjunction with water permeability, the same functional structure of ROMEX jointing mortars provides another significant benefit – resilience to the damaging forces of water expansion when it freezes, commonly called ‘frost heave’. Firstly, water is rarely trapped in Romex paver joints, because it can now pass right through. Secondly, if any water is trapped in the assembly – during ground frost or dramatic temperature drops – it is able to expand into the hollow areas of the matrix. 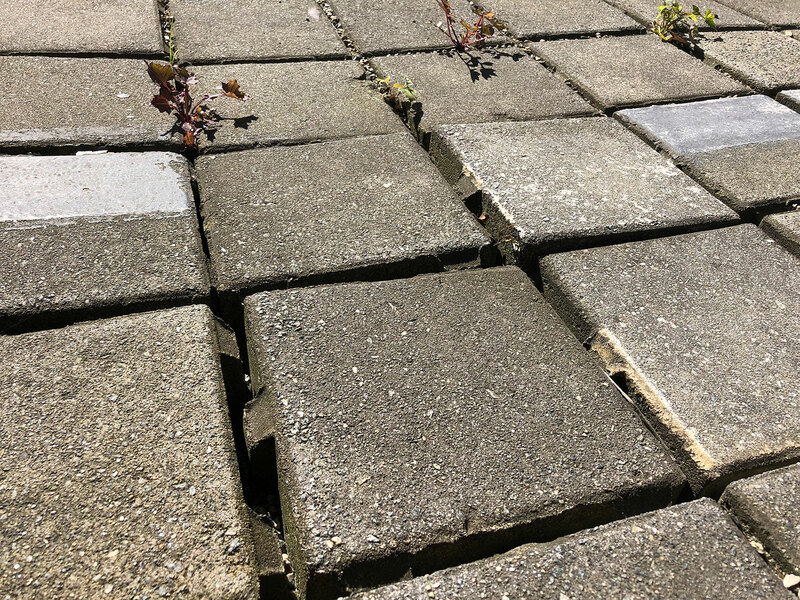 So, unlike the same expansion forces pushing against impervious conventional materials – using permeable Romex jointing means cracks and breakage in paver joints from frost heave are avoided. The capillary effect is the way liquids react when they come into contact with capillaries i.e. tight pipes, cracks or hollow areas in hard materials. Example: if you dip a glass tube vertically into water, the water will rise slightly in the tube against gravity. This effect occurs due to the surface tension of the liquids themselves and from the border surface tension of the liquids with the hard surface ( in this example: glass). In the construction industry, when synthetic resin bound paving jointing mortar is used i.e. on paved stone surfaces that have been jointed with synthetic resin based paving jointing mortar, the capillary effect can be seen in the joints, because depending on the jointing mortar used and the pore content or sand grain size, varying amounts of moisture are able to rise against gravity. This means that even if a foundation is only slightly water permeable, water will not remain permanently in the joints. Using ROMEX systems, you can do your part to be environmentally friendly. ROMEX products strengthen surfaces, paths and squares, without sealing them! HOW DOES ROMEX TRASS BED ENABLE PERMEABLE PAVING? ROMEX TRASS BED drainage bedding mortar is a ‘permeable slab’ for a bound assembly (‘wet-lay’ or ‘mortar-set’) of unit pavers. TRASS BED replaces a conventional, rebar-reinforced slab; this layer in the assembly is no longer required. In many cases, neither is the drain mat layer. TRASS BED is the slab and the drain mat - all in one. As such, ROMEX TRASS BED is the intended and ideal sub-grade compliment to ROMEX Permeable Jointing Mortars, for any bound paving assembly. Used in conjunction with the ROMEX ADHESION ELUTRIANT thin set bonding compound, these three elements – bedding, bonding and jointing - form the ROMEX “RSG” System, which provides a unit paver hardscape that is load-bearing, frost-resistant and highly water-permeable - the first and only one of its kind in the industry. Superior strength, resilience and permeability are achieved with only a fraction of the thickness compared to conventional - roughly 40mm or 1½” deep for pedestrian loads and 75mm or 3” for vehicular (call us to discuss your specific site conditions). Forming is no longer required, nor is rebar. 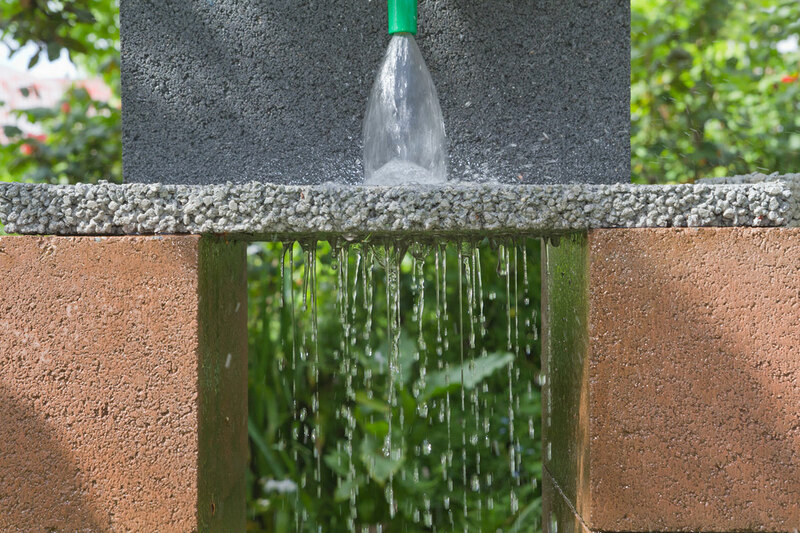 Instead, TRASS BED uses 4-8mm aggregate for its structure, which provides a more workable consistency that holds shape during install and won’t slough during paver laying. 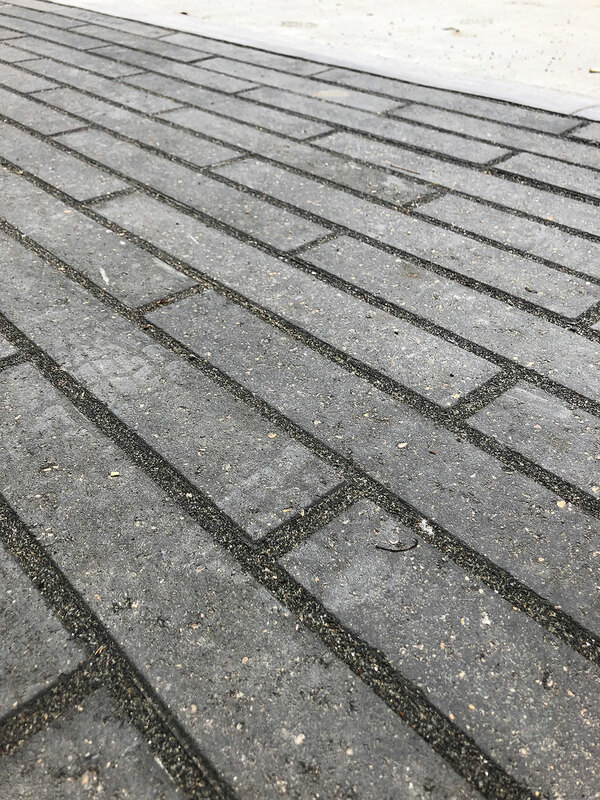 After curing, the bonded aggregate pieces provide integrity - while still leaving tiny channels between each piece of stone through which water can travel. ROMEX TRASS BED is suitable for installs on architectural slab with waterproof membrane, with or without insulation, or be installed directly onto clear crush or similar for installs on grade. As a final note, this means ROMEX TRASS BED is also frost-heave resistant – because water is never ‘trapped between a rock and a hard place’. If cracks form in conventional paving, liquid water will get in where it isn’t wanted, and when it freezes and expands, the forces of nature will eventually win over the bonding strength of the assembly, heaving and pushing pavers out of surface alignment. With ROMEX TRASS BED, this risk is eliminated, because water can pass straight through, evaporate out or, if suddenly frozen while in the bedding itself, it can expand and contract within the matrix, over and over again. With a Romex RSG paving assembly, 'freeze-heave' has become a thing of the past. Call us to learn more about how you can ensure your next bound assembly will stand the test of time by letting water do what it needs to do – without affecting your paving surface. There are numerous permeable paver options on the market, with offers from most major manufacturers. ‘Permeable pavers’ are not themselves pervious, but instead have wider joint spacing between each paver to allow stormwater to flow down and through to the sub grade below. Pre-cast permeable pavers have larger built-in joint spacers, and natural stone pavers are simply set with a wider joint line, commonly from 6mm wide and up. However, all permeable pavers have a common design component for their assembly - that the joints are filled with 'loose grit'. This creates an inherent challenge for the performance, resilience, and cost of the system. 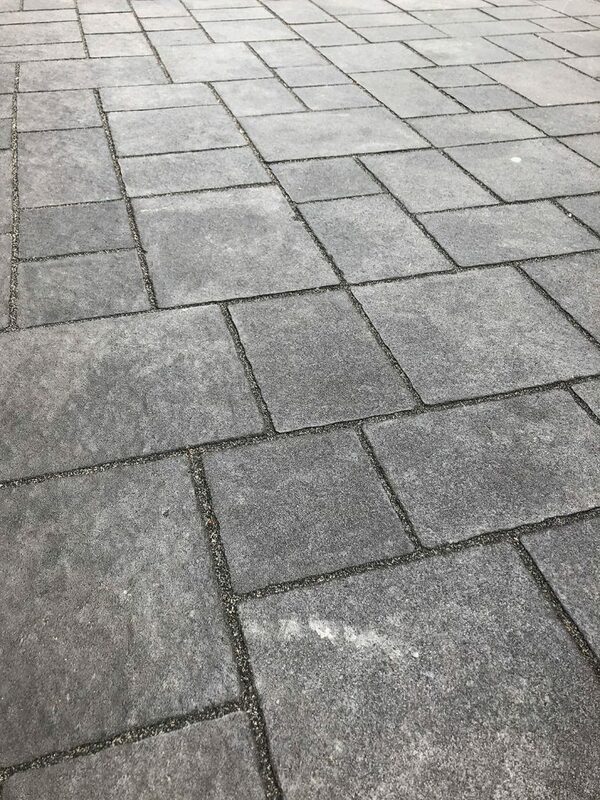 'Loose grit' does not stay in place over the long term to keep pavers held together. 'Loose grit' does not stop weeds from growing up and ants from digging down. 'Loose grit' will collect organic matter and grow moss which inhibits permeability. 'Loose grit' will collect other things, like garbage and cigarette butts. And finally, when it gets dirty or mossy, 'loose grit' cannot be cleaned or pressure washed. When loose grit goes missing, surface integrity is compromised. When debris collects, loose grit cannot be pressure washed. The remedy presented for cleaning the joints and restoring permeability? Vacuum out the compromised loose grit from the joints with a large vacuum truck, and re-install new loose grit – and start the cycle over again. This is commonly required to be re-done each year. So while these jointing materials are economical up front, re-installation and/or repair costs can continue to add up over time. We ask - can’t there be a better way to build lasting, functional, economical, and low-maintenance permeable paving? With Romex resin-bound permeable Jointing Mortar, it’s a one-and-done solution. Installed in a fluid state, the resin-aggregate mixture fills every joint completely and without voids, sinking down deep in between each paver, connecting to their sidewalls and to the bedding layer beneath. After it sets, the unique structure of Romex Jointing Mortar creates an obscenely strong and comprehensive connective network between all the pavers, securing them together as one to form a strong, cohesive surface – while still allowing rainwater to flow down and through the paving assembly. With Romex, every joint is filled completely. Permeable pavers finished perfectly with Rompox Drain. Romex Jointing Mortar will stay in place and keep the pavers secure. Romex Jointing Mortar will stop weeds from growing and stop ants from digging. Romex Jointing Mortar will limit the collection of garbage or debris. And when the surface gets dirty or mossy? It can be cleaned and pressure washed, as often as the site requires, and the paving surface aesthetics - and permeability - can be restored. So when you want resilient and permeable paving system that lasts the test of time: don't mess about. Do it right. With Romex. For more on permeable paving, check Wikipedia here.